The Coalition for Better Ads has awesome new standards that make the internet a better place! We're revamping our in-content logic to match. The Coalition for Better Ads is being adopted by many major players in the ad industry, and Mediavine is leading the charge by giving you the option to run these new ad standards in your in-content ad placements. It is a brand new in-content logic that is going to intelligently space your in-content ads to ensure we are always within the CBA guidelines. These state that ad content can not be more than 30% of the total page height. This means that in most instances, adopting these new standards will allow for additional in-content placements, and better performance for your in-content ad units! Want to try and see for yourself? 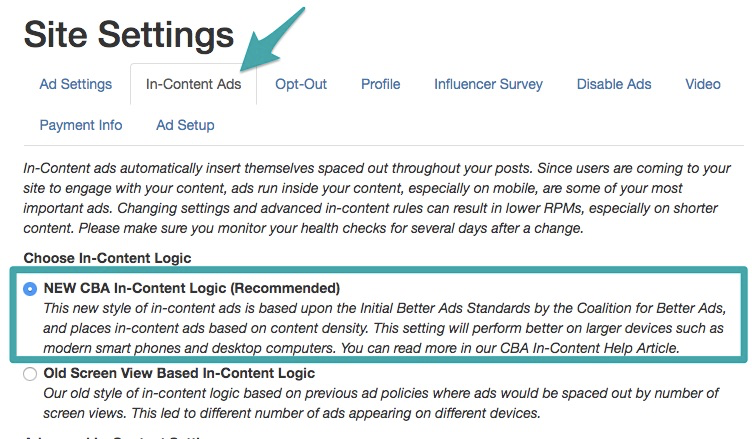 Just visit your Dashboard Settings area, and check out our new In-Content Ads tab, and choose the NEW CBA In-Content Logic option at the top of the screen. The CBA In-Content Logic works by measuring the entire length of your content, and then only placing enough ads inside to fill the % of the total content you have chosen for your site's ad density. The default is 30% on mobile and 25% on desktop. The logic will then space them through the post with a minimum of 2 paragraphs between ads. If you choose to customize the settings of your in-content ads, please be aware that any changes can have large impacts on your in-content ad performance and your RPM. It is VERY IMPORTANT to monitor your in-content Site Health Checks in the week or so following a change. The new CBA logic comes with its own set of frequency, spacing, and limit controls for both mobile and desktop. You can adjust these as necessary. CAUTION: Decreasing ad density will also decrease your RPM. By default, ads on desktop and mobile will be spaced at least 2 paragraphs apart in your content. This can be adjusted from 1 to 3 on both mobile and desktop. CAUTION: Increasing ad spacing will give you fewer ads in your content. This will mean lower earnings and RPM. Mobile and desktop ad limits are set independently of one other. Our recommended setting is "None". This will allow our logic to automatically limit the ads based on your density settings. If you would like to further limit the total number of ads allowed in-content per post, you can do so using these settings. This can be helpful for sites with EXTREMELY LONG content where there are a significant number of posts over 2000 words long and including several long photos. Q: What's different than before with this new logic? A: Previously, we spaced out your ads according to screenviews, and two in-content ads would never be within the same screenview. With this new CBA in-content logic, it is possible to have two ads in one screenview but still remain compliant. A: Not long! I'd let it run for at least 3 days though, and take note of your in-content health check score before you turn it on. The Health Check looks at the last 3 days of data, so over the course of the next three days you'll start to see any changes made to the settings and the controls reflected there. If you need help, just let us know!